This plugin spotlight features the AMS RMX16 Digital Reverb by AMS Neve and Universal Audio, a faithful emulation that harnesses the exact legendary sound of the famous hardware. 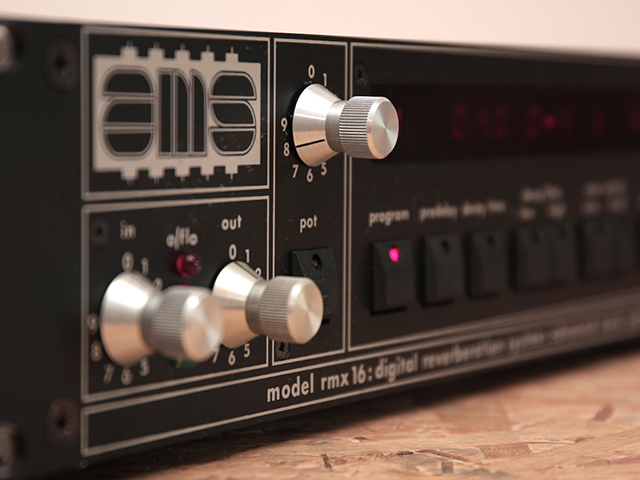 The legendary AMS RMX16 was the world’s first microprocessor-controlled, full-bandwidth, digital reverberator hardware. The renowned sounds of the RMX16 are instantly recognizable and are heard on a massive scale of seminal recordings from the 1980s onward. It’s sought after characteristics are still used today, and the RMX16 can found in nearly every major recording studio around the globe. Thanks to the innovators at Universal Audio and AMS Neve, the unique and lush reverb programs of the original unit are expertly captured in the only authentic emulation of the AMS RMX16 Digital Reverb plugin which is designed exclusively for UAD-2 hardware and Apollo interfaces. With the merging of analog heritage and groundbreaking digital designs you can now enhance your mixes with all nine classic sounds of the original RMX16 which are Ambience, Room, two Hall types, Plate, Echo, Chorus, NonLin, and Reverse. Better yet, you also get an addition of modern features such as dry/wet mix, wet solo, and easy “click-and-type” editing of control values not available on the hardware model. In developing this UAD plugin version of the landmark processor, AMS founder and the original hardware designer Mark Crabtree revisited his initial schematics and extensive notes to design an emulation that harnesses the exact iconic reverb and delay algorithms of the famous hardware AMS RMX16. After a laborious two-year process, the end result delivered an impressive reproduction so faithful that even the manual is a verbatim transcript of the original published version. Even more remarkable is that Mark Crabtree tuned the RMX16 by ear instead of following specs to design an effect processor that is more musical than mathematic. Working with the RMX16 is pretty straight forward. The front panel provides all the controls; there are no hidden panels and options. Identical to the original, a large classic looking digital display shows you all the details. Input and output levels are set using the rotary controls on the far left side, accompanied with a small LED overflow meter that makes it easy to level match and control the signal to avoid clipping. Dialing in the desired reverb effect is accomplished by clicking the ‘program’ key and then ‘nudge up’ or ‘nudge down’ to select the effect you require. Next, fine-tune the reverberation by selecting any of the function keys below the display and then adjusting its numerical value to control various sound shaping settings in one of four ways: Specific parameter values can be set using the keypad, clicking the ‘nudge’ keys, or using the rotary pot. The new fourth option exclusive to the UAD plugin is the ability to click in the display window and type in a value. In addition, the RMX16 comes with some excellent presets courtesy of a few successful audio engineers. Founded in 1976 by former aerospace technicians Mark Crabtree and Stuart Nevison, Advanced Music Systems (AMS) now AMS Neve is one of the early pioneers in manufacturing digital audio effect processors. Both sharing a passion for audio and having a wide expertise in digital electronics, the two set out to design some of the most recognized professional audio equipment in the industry. In 1981, at a time when digital audio processing technology was new, cutting–edge, and exciting, AMS released one of their most successful and enduring products – the microprocessor-controlled AMS RMX16 Digital Reverb. During this era, large plate reverbs were still one of the primary sources for artificial reverberation in major recording studios. In addition, they expensive and also took up a lot of space. The much smaller AMS RMX16 brought a significant advancement in technology, affordability, and required far less physical space or isolation needed by a plate. While digital delay units were extremely popular at the time, digital reverb technology was still new and very expensive. The RMX16 introduced a fascinating new characteristic sound and friendly usability that quickly gained acceptance with musicians and engineers making it one of the most famous effects processors of all time. What also makes this reverb unit stand out from its competitors other than its compact size and signature sound is that it was designed to be musical rather than simply implementing mathematical algorithms. Each of the nine programs was tuned and retuned by ear over an extended period of time to provide a variety of “sweet-spot” settings that resulted in a classic sound that’s hard to match. The AMS RMX16 is a brilliant sounding reverb and my new favorite! I was blown away how awesome this sounded just loading the default. I immediately fell more in love with its sound after playing around with different reverb types, predelay, and decay values. However, no great sounding plugin is capable of capturing complex sonic characteristics without a price of straining the CPU. The RMX16 is no exception; the UAD plugin sounds absolutely amazing but uses up a significant share of DSP to give us the ear candy we love. Check your resources before loading up an instance or two. Also, it’s inspiring to have the opportunity to work with a legendary processor that has been a major recording studio staple for over three decades. Not many reverb plugins can deliver this magnitude of performance at a fraction of the price that aging hardware versions are going for, which are still in high demand. The Universal Audio AMS RMX16 is remarkability one of the finest “character” reverb plugins available today at an affordable price. Another great achievement for both Universal Audio and AMS Neve! The AMS RMX16 Repeater is available to download at Universal Audio. The post Plugin Spotlight: AMS RMX16 by Universal Audio appeared first on Dubspot Blog.